Sichuan cuisine is much more than just chillies and peppercorns. It is a multi-faceted and rich gastronomy culture that displays incredible depth and breadth encompassing a myriad of taste profiles – from sweet and sour vinegar sauce based, to numbingly spicy or “ma la”. 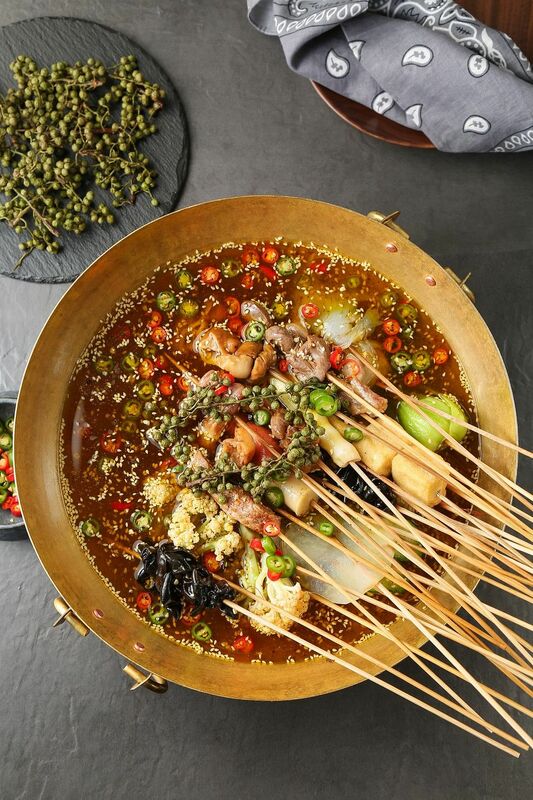 In 2010, Chengdu, the capital of Sichuan province, became Asia’s first city to be designated a “City of Gastronomy” by UNESCO, a testament to the status of Sichuan food. Indeed, this cuisine is fast winning the hearts and minds of foodies here, if you go by the number of Sichuan restaurants peppering the island these days. If you are looking to go on a Sichuan cuisine adventure, here are some of the best places to begin your quest. Lao Si Chuan is at 50 Tiong Bahru Road, Singapore 168733, tel: 6222 9489. Tucked away in a boisterous shophouse along Mosque Street, Si Wei Mao Cai has gained a steady following for more than seven years now. They serve cuisine from Mian Yang, the second largest city in Sichuan, whose cuisine style differs from that of Chengdu (which most people associates with Sichuan cuisine). 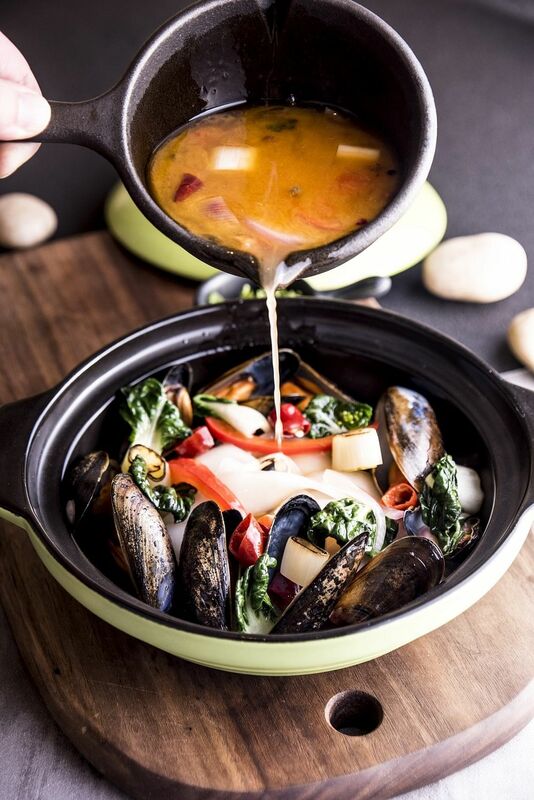 Mian Yang cuisine focuses on the natural tastes and the cohesiveness of flavours, which result in dishes that achieve an exquisite balance, showcasing the freshness of ingredients and a precision in seasoning. The chefs are all from Mian Yang and almost all ingredients are imported from Sichuan, especially key ingredients such as Sichuan peppers. Signature dishes include the moreish and non-spicy soy sauce-based Duck Stew with Potato ($26), still one of their best sellers since its debut in 2011. Some dishes, especially those that use “live” seafood, requires pre-ordering to ensure the freshness of the produce and to minimise wastage. 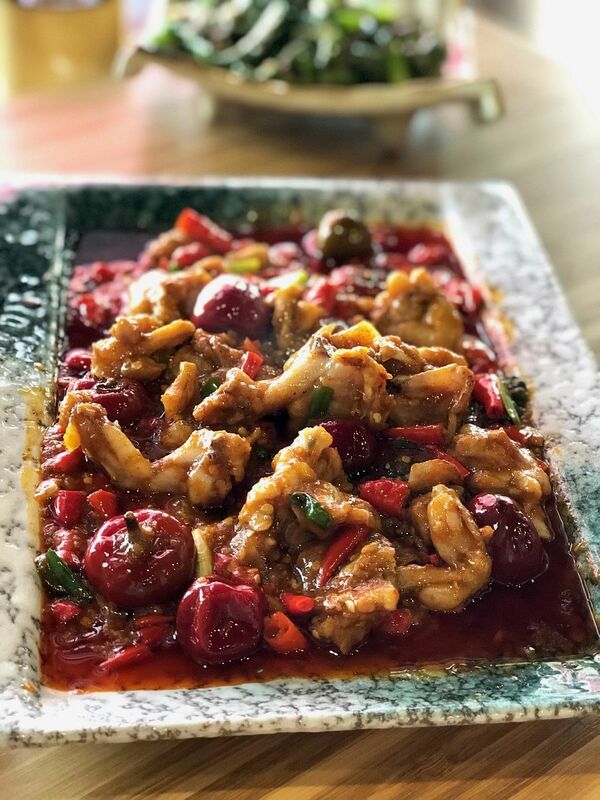 Recommendations include the Lang Zi Catfish ($29), that has pieces of fresh cat fish cooked in a exquisitely spicy broth that perfectly complements the taste of the fresh fish, and Si Chuan Chili Frog ($26), which is fresh and fragrant with bright, spicy notes. Portions are generous and if you are ordering for two, then perhaps one main and a couple of side dishes will do. They have also recently opened a “mala” chuan chuan, or skewers, shop a few doors down and we cannot wait to check it out. Si Wei Mao Cai is at 33 Mosque Street, Singapore 059511, tel: 6223 1170. A pioneer of Sichuan cuisine in Singapore some 20 years ago, Si Chuan Dou Hua is recognised for the quality of its Sichuan and Cantonese cuisines – they now have four outlets in Singapore at Top of UOB Plaza, PARKROYAL on Kitchener Road, PARKROYAL on Beach Road and Our Tampines Hub. Helmed by Executive Chef Zeng, the culinary team at Si Chuan Dou Hua Restaurant at PARKROYAL on Beach Road brings on a spectrum of classic Sichuan dishes ranging from the mild and umami Minced Chicken with Fungus Soup to the fiery and robust Chong Qing Diced Chicken with Dried Chilli (aka La Zi Ji) – and their smooth and silky dou hua is still homemade. Si Chuan Dou Hua Restaurant is at PARKROYAL on Beach Road, 7500 Beach Road, Singapore 199591, tel: 6505 5722. This renowned “chuan chuan”, or “dip pot skewer” brand from China, where it has over 40 stores, is located at Orchard Central. The “open-space” concept restaurant exudes a casual, laid-back atmosphere with its contemporary décor and upbeat music. The specialty here is, well, their skewers. Unlike the usual hotpot-style, there is no cooking going on at the table. A bite-sized piece of meat or vegetable on sticks (starting from $0.50 per stick) are first cooked in a special broth brewed from pork bones and chicken, then bathed in the diners’ choice of spicy broth ($8.80, choose from mild, medium or OMG) or chicken soup ($7.80) to further absorb the goodness of the soup, which is served warm in a deep pot. There are over 20 items to choose from, including “ma la” beef, chicken gizzard, tofu skin, broccoli, sliced potatoes and more. The spicy broth is addictive and we would recommend going for mild if you want to better savour the ingredients. If you prefer to have dishes, the spicy Sichuan chicken ($12.80) and Spicy Pig’s Brain ($8.80) are popular with regulars. And if you have the patience, the “ma la” small lobsters, or yabbies, may be up your alley, but you would need to dip the meat into the sauce for more punch. All in all a very pleasant experience and a great place for gatherings with friends. Enjoy Mala is at #04-22, Orchard Central, 181 Orchard Road, Singapore 238896, tel: 6509 0295. At Birds of A Feather, an Instagram-worthy all-day dining café and bar, diners can enjoy an array of Sichuan-inspired dishes rooted in Western techniques. In addition to their Braised Tofu Sichuan Way with Rice ($19) aka Mapo Tofu, and Spicy Oriental Bolognaise ($20) of angel hair pasta with spicy pork ragu, French-trained Head Chef Eugene See has added dishes inspired by his travels to Chengdu. Highlights include the Sweating Mussels ($29, dinner only), a twist on the usual white wine mussel dish prepared with a chicken stock spiked with garlic, onions, leeks, bell peppers and dried Sichuan peppercorns, and the comforting Sichuan Oxtail Soup ($24), Chef See’s take on the classic Sichuan pork trotter soup made with oxtail braised in a beef bone stock perfumed with leek, spring onions, angelica root, dangshen (poor men’s ginseng) and yuzhu (fragrant solomonseal rhizome). End the meal with one of their signature coffees – the Feather’s Coffee ($8) with long black, steamed milk and burnt meringue is a firm favourite here. 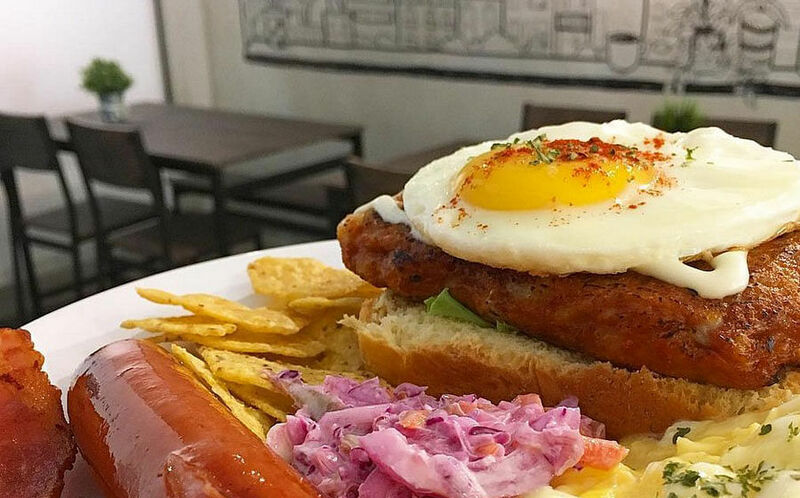 Birds of A Feather is at 115 Amoy Street, Singapore 069935, tel: 6221 7449. Chengdu is at 74 Amoy Street, Singapore 069893, tel: 6221 9928. Shu Yan, with its dining rooms and private rooms decked out in dark wood, dishes up contemporary Sichuan fare, which sees influences from a range of Chinese cuisines – Huaiyang and Cantonese included. As such, flavours here may be more mellow as compared to that of a traditional Sichuan establishment – the level of spiciness is also indicated on the menu for easy reference. The “Shu Yan” Chicken Pudding ($6.80 per pax) makes a good starter. While the chicken pudding – a classic “tofu” dish made with finely minced chicken and egg white — is traditionally served in a clear soup, the version here uses a golden thick soup instead that adds a pleasant richness to the dish. 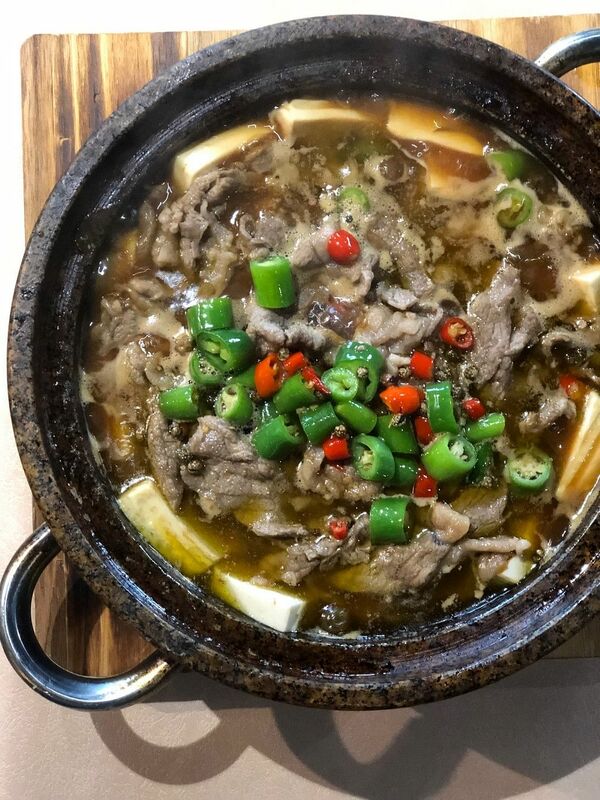 We would also recommend The Stone Grilled Beef and Tofu ($38), a hearty and mildly spicy dish of sliced fatty beef and tender tofu served in a stone pot that arrives at the table still bubbling hot. The “Shu Yan” Boiled Fish Fillet in Spicy Soup ($48), which technically is sliced fish cooked in more oil than soup, is another popular dish with the diners here. While it has a two-chilli rating, we found the heat level manageable. 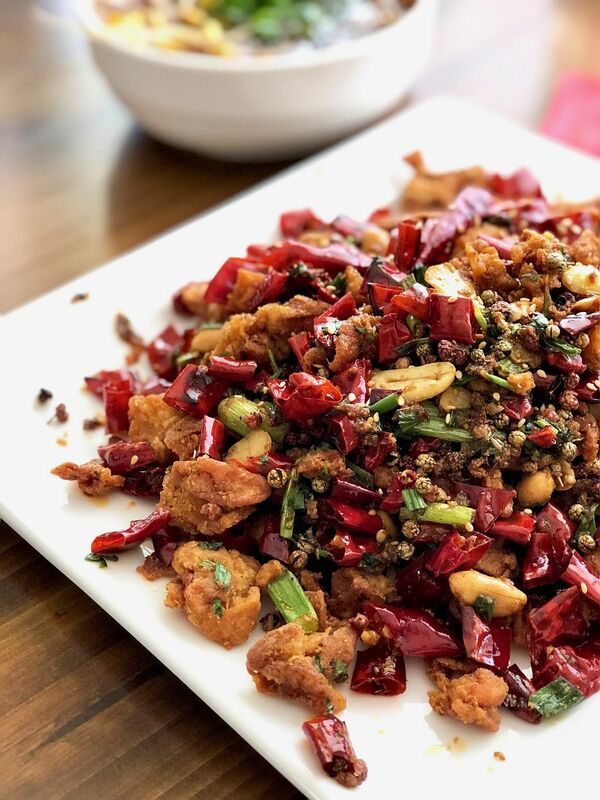 Same goes for the three-chilli rated dish of Fried Chicken with Dry Chilli ($28), which has plump nuggets of chicken mixed with a pile of dried red chillies. So if you prefer to turn up the heat, do check with the service staff. Set lunch for one person (a choice of two appetizers, a main course and a drink, comes with rice) is available on weekdays at $15.80 and they also have a good value Lunch Set for two people (one appetizer, a main course, a vegetable dish and a dessert, comes with rice) priced at $39. Shu Yan is at #01-51/54 UE Square, 207 River Valley Road, Singapore 238275, tel: 6732 1898. 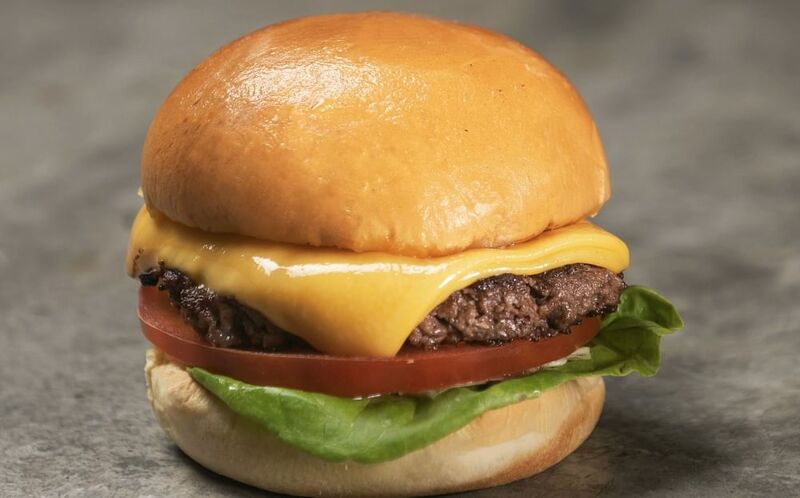 Shisen Hanten was started in 1958 in Japan by Executive Chef Kentaro’s grandfather, the late Chen Kenmin who is regarded as Japan’s “Father of Szechwan Cuisine”. 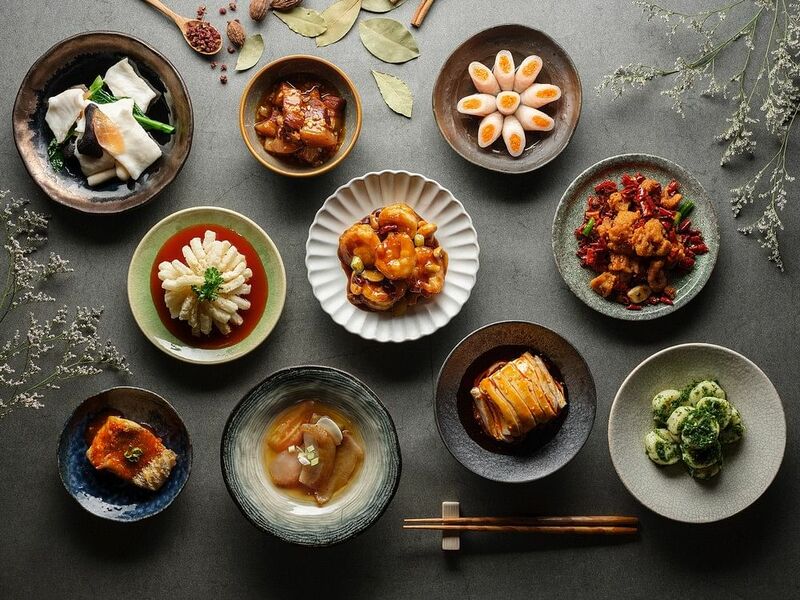 The Singapore outpost two Michelin-starred Shisen Hanten by Chen Kentaro at Mandarin Orchard has also been winning fans over with their elegant approach to Sichuan cuisine. Chef Kentaro himself has worked in various Sichuan restaurants across Chengdu under the tutelage of notable Sichuan masterchefs to perfect his foundation in Sichuan cooking. 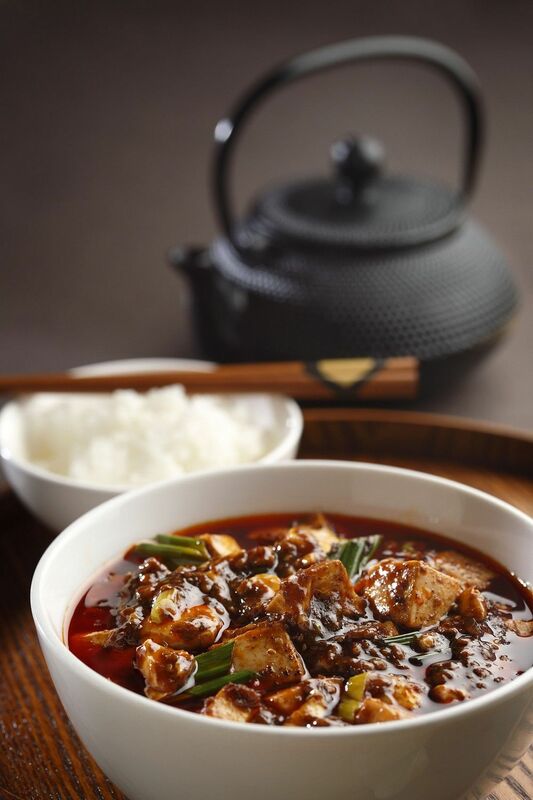 The signature Chen’s Mapo Tofu ($26) is a must-try – the recipe has been in the family for three generations, but Chef Kentaro’s version presents bolder flavours. It is a satisfyingly robust and progressively spicy dish (the heat and the numbing sensation creeps up on you) prepared with a special chilli bean paste, which has been fermented for three years. Perfect with a bowl of fragrant Hokkaido rice, or two. Another popular dish is the Stewed Fish Fillet in Super-spicy Szechwan Pepper Sauce ($38), which is sliced fish is cooked in a chilli and Sichuan peppercorn spiced soup that is not as oily as its traditional counterparts. 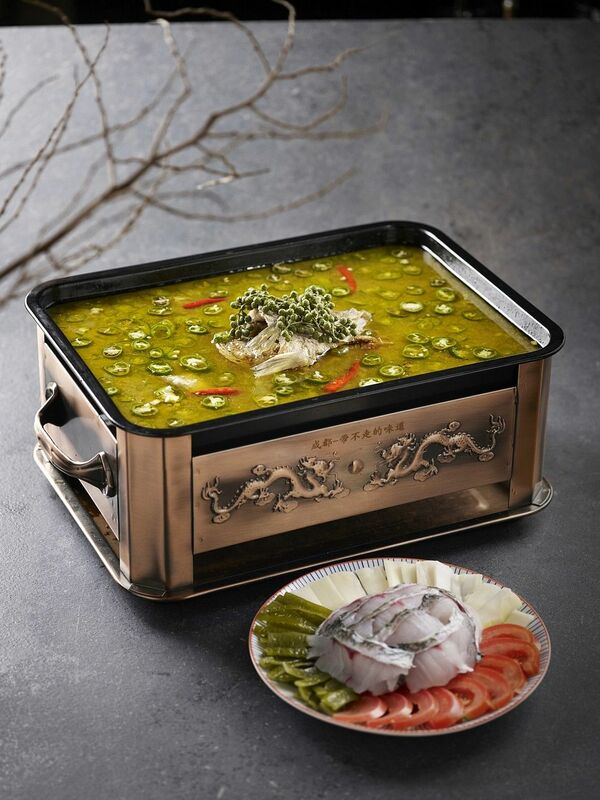 The flavoursome broth is of the essence here, the heat from the broth (which is not inferno spicy) takes over your palate gradually and the crunchy soy bean sprouts provide a pleasant contrast to the tender slices of sea perch fillet. A four-course business set lunch ($42 per pax, min of two pax) is also available. Shisen Hanten is at Level 35, Orchard Wing, Mandarin Orchard Singapore, 333 Orchard Road, Singapore 238867, tel: 6831 6262.